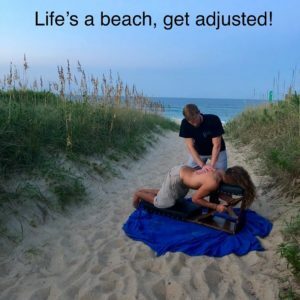 Life’s a beach, get adjusted!!! In this world of stressful thoughts, traumas, and toxins it’s crucial to keep your nervous system running at optimal potential! Health is Wealth! Dr. Gareth analyzes and puts together a specific customized plan of care based on the objective findings, goals and needs of the patient. The plan includes the 12 Week Transformation journal for care, results and a detailed calendar plan of action. The practice utilizes specific analysis of the spine, postural screenings, precise adjustments, custom foot and spine orthotics, spinal corrective traction, nutrition, and functional and primitive movement exercises. The care plan is designed to restore the body’s optimal structure and function and to gain knowledge to sustain and progress a healthy lifestyle. A pain free, healthier body and better life is possible.